Introduction: Acute pancreatitis in an uncommon complication after elective laparoscopic cholecystectomy for gallstone disease. The purse of the study is to determine the incidence of acute pancreatitis after elective laparoscopic cholecystectomy and to postulate potential ways to avoid this complication. METHODS and Procedure: A retrospective study of 4,101 consecutive elective laparoscopic cholecystectomies at a single institution was undertaken. Patients studied included 76.6% of women and 23.3%, with mean age of 52.1 years (range from 10-95). Surgical indications were cholelithiasis in 65.1%, biliary dyskinesia in 17.3%, cholecystitis in 7.1%, pancreatitis in 5.2%, choledocholithiasis in 2.3%, and others in 0.9% of cases. Intraoperative cholangiogram were performed in 75% of cases. Review of operative record showed that 5 patient had stone retrieval from cystic duct while performing intraoperative cholangiogram. Six cases demonstrated presences of stones in CBD requiring postoperative ERCP and stone removal. Intraoperative cholangiogram was not performed in Twenty five (995/4101). Only 2 cases had postoperative pancreatitis, which were diagnosed in the immediate postoperative period because of increased abdominal pain. Both patients did not have intraoperative cholangiogram during laparoscopic cholecystectomy. Pancreatitis resolved spontaneously and patients did not require any subsequent surgical intervention. 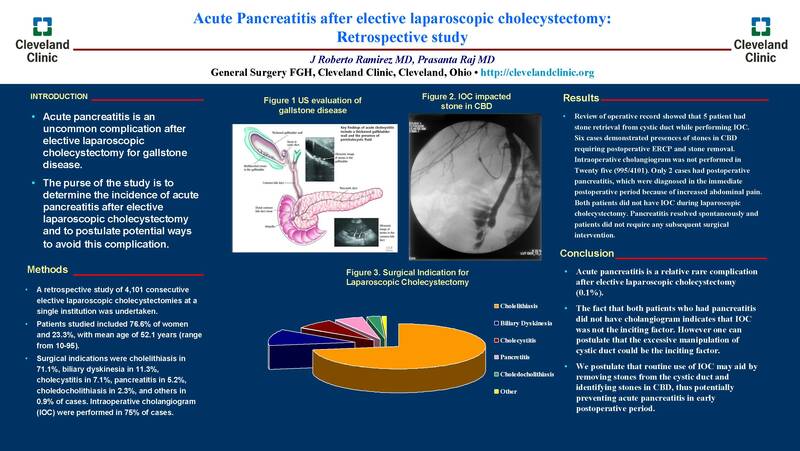 Results: Acute pancreatitis is a relative rare complication after elective laparoscopic cholecystectomy (0.1%). The fact that both patients who had pancreatitis did not have cholangiogram indicates that intraoperative cholangiogram was not the inciting factor. However one can postulate by not doing cholangiogram stones it is possible that stones from the cystic duct can fall into CBD by manipulation and can initiate pancreatitis in the early post op period. We postulate that routine use of intraoperative cholangiography may aid by removing stones from the cystic duct and identifying stones in CBD, thus potentially preventing acute pancreatitis in early postoperative period.